Singapore’s healthcare sector is typically viewed as defensive and poised to enjoy multi-year growth prospects. Between July and Dec 2018, the sector saw 6 consecutive months of net inflows by institutional investors, following increased risk aversion on the back of higher market volatility and persistent US-China trade tensions. In 2018, the iEdge SG All Healthcare Index generated a total return of -3.3%. This compares with total returns of -6.5% for the STI, -3.2% for the MSCI Asia Pacific Health Care Index, and -16.5% for the MSCI Asia Pacific ex-Japan Health Care Index. 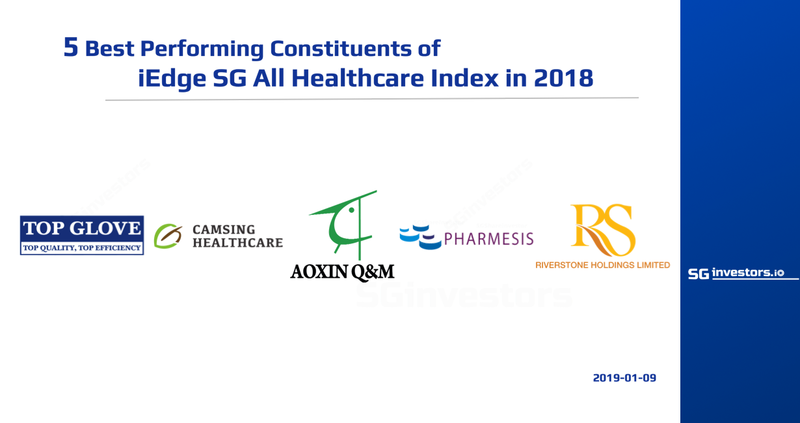 In 2018, the five best-performing constituents of the iEdge SG All Healthcare Index were: Top Glove (+40.6%), Camsing Healthcare (+19.5%), Aoxin Q & M (+10.5%), Pharmesis (+8.7%), and Riverstone (+7.9%). These five healthcare plays have averaged a total return of +8.6% over the past year. The iEdge SG All Healthcare Index is a free-float, market capitalisation-weighted index that measures the performance of Singapore’s listed healthcare sector. In 2018, the Index, which comprises 31 constituents, generated a total return of -3.3%. This compares with total returns of -6.5% for the benchmark Straits Times Index (STI), -3.2% for the MSCI Asia Pacific Health Care Index, and -16.5% for the MSCI Asia Pacific ex-Japan Health Care Index. 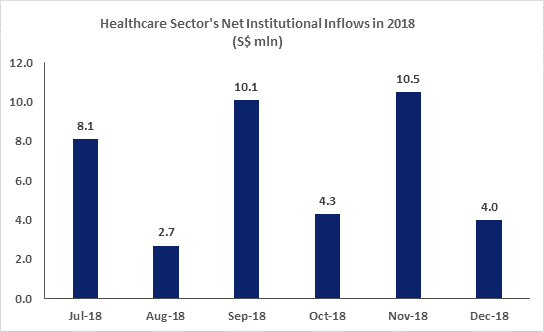 Between July and December 2018, the Healthcare sector saw six consecutive months of net inflows by institutional investors – S$8.1 million in July, S$2.7 million in August, S$10.1 million in September, S$4.3 million in October, S$10.5 million in November and S$4.0 million in December, according to SGX data. The sector has benefited from rotational flows, following increased risk aversion on the back of higher market volatility and persistent US-China trade tensions. In 2018, the five best-performing constituents of the iEdge SG All Healthcare Index were: Top Glove Corp (+40.6%), Camsing Healthcare (+19.5%), Aoxin Q & M Dental (+10.5%), Pharmesis Intl (+8.7%), and Riverstone Holdings (+7.9%). Of the five stocks, two are makers of rubber/surgical gloves, which are indispensable in medical procedures and will benefit from the region’s increased patient demand. Over the past year, these five healthcare plays have averaged a total return of +8.6%, bringing their three-year and five-year total returns to -3.5% and +63.3% respectively. In 2018, the five least-performing constituents of the iEdge SG All Healthcare Index were: Asiamedic Ltd (-66.1%), Clearbridge Health (-53.0%), Cordlife Group (-51.2%), Medtecs Intl (-44.9%), and Thomson Medical Group (-41.9%). These five stocks have averaged a total return of -51.4% over the past year. The table below details the ten best-performing constituents of the iEdge SG All Healthcare Index, sorted by 2018 total return. Across Asia and in Singapore, healthcare spending by governments is set to rise. Asia’s share of government spending in healthcare has room to expand – it is estimated to be on average one-third less than the OECD average, according to OECD and EY data. Likewise, when unveiling Singapore’s 2018 Budget last year, Finance Minister Heng Swee Keat said the government would put aside some S$10.2 billion for healthcare expenditure, adding that he expects Singapore’s average annual healthcare spending to rise from 2.2% of gross domestic product (GDP) today to almost 3% of GDP over the next decade. This represents an increase of nearly 0.8-percentage point of GDP, or about S$3.6 billion in today's dollars. He also noted that within the next five years, Singapore will boost its patient care infrastructure by building six more general and community hospitals, four new polyclinics as well as more nursing homes and eldercare centres across the island. Seven of the 10 largest constituents of the iEdge SG All Healthcare Index report more than a third of their group revenues to Asia Pacific ex-Singapore as well as Middle East and Europe. Their operations and assets span the following geographies: Malaysia, Vietnam, Thailand, Cambodia, Brunei, Indonesia, Hong Kong, China, Japan, South Korea, Bangladesh, India, Turkey, Bulgaria, and Macedonia. Investors can participate in the structural Asian healthcare theme through SGX-listed healthcare stocks that are rapidly expanding into regional and global markets to meet growing patient needs.